Jeremy and I aren’t big on sugar cookies, or most other cut-out cookies for that matter. Yet for some reason, we couldn’t resist buying a copper cookie cutter of an angel when we were at Whole Foods just before Thanksgiving. I didn’t notice the price tag, and if I had, I think we would have passed it by (8 bucks for one cutter!). Since we got it, though, I decided a batch of sugar cookies was in order to show it off. 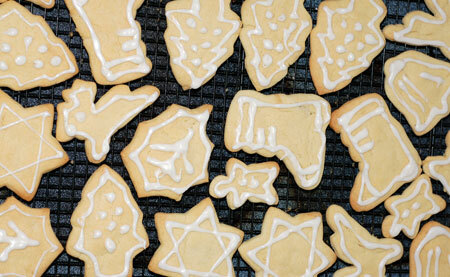 The eagle-eyed among you are now noticing that there are no angel cookies in the photo above. That’s because I decided to include some sugar cookies with the variety boxes we shared at work this year, and I wanted a bunch of small shapes for that. I reserved half the dough in the fridge, however, and will roll that up this weekend and break in the angel cutter while my parents are visiting. It was good forethought on my part, I have to say, because the last snowball disappeared from the last box at lunchtime today, so more cookies are definitely in order. As I mentioned, we aren’t huge sugar cookie fans, but we both love this recipe. It’s easy to work with and produces perfect cookies that hold their shape. Mine were crisp straight from the oven, and softened up after a day or two of storage with everything else, but I actually preferred them that way. I used a simple milk-and-sugar glaze mixed to pipeable consistency, and squeezed out some very simple designs through the corner of a Ziploc. I don’t have any food coloring, but white is always classic, right? Anyway, if you use the same proportions of glaze as I did, be sure to allow plenty of drying time. I put my cookies away too soon, and a lot of the frosting got mussed, but it hardened nicely overnight; I think I was just impatient. Chill dough (you can skip this if you are in a hurry). Roll dough to about 1/8” and cut. Bake at 375F for 8-10 minute, or until just golden around the edges. Source: My co-worker, Alice. This is her family recipe for sugar cookies—lucky family!